Too Fat Lardies have a new expansion for their I Ain’t Been Shot Mum tactical WW2 miniatures ruleset. 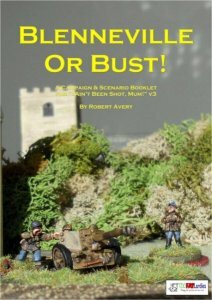 Blenneville or Bust is a 300-page PDF campaign pack that covers fictional late-war encounters on the Western front. Blenneville or Bust! is a collection of fictional late war, western front scenarios set in a valley just south of the Normandy beaches a short time after the D-Day landings. US and British forces are attempting to drive through the German defences in the Ribeaux valley in order to break out into the open country beyond, the Germans are trying to stop them. The pack contains thirty-one individual scenarios set up in a five-step pyramid campaign i.e. scenario 1 leads to either scenario 2A or 2B; the result of this second game leads to one of scenarios 3A, 3B, 3C or 3D; and so on until scenarios 5A to 5P. Although written as a fictional campaign booklet, no two scenarios are the same: each is unique and is also designed to be played as an individual game. If you are unfamiliar with I Ain’t Been Shot Mum it is an excellent set of company level rules. It is considerably more streamlined than Flames of War and thus allows players to concentrate more on tactics and maneuver than rules. If you like tactical WW2 gaming check it out. This entry was posted in 15mm, Miniature Wargames, News and Updates, WW2.